These Sporty Ear Buds in a custom imprinted pouch is a perfect giveway for gyms, colleges and travelers of all ages! Looking for a gift everyone will love? These Square Bluetooth Promotional Ear Buds w/ Custom Case are rechargeable and offer about 2.5 hours of listening time! Competitors will turn green with envy when they see your logo on these Bluetooth custom headphones with deep bass and high clarity. Listen to your favorite song with these trendy and high quality Full Color Mobile Odyssey Braided Custom Earbuds! These earbuds feature a fashion forward braided fabric cord. 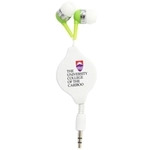 Promotional earbuds set with interchangeable earbud covers. Rock out to your favorite songs with this chic Aluminum Cube Bluetooth Custom Speaker. Built in music controls so you can change the volume and song directly without using your phone. Your logo will receive a lot of attention when imprinted on these shoe lace style customized earbuds. Make your gift a memorable one with this Bluetooth printed speaker available in a variety of bold colors. This Wifi Bluetooth Custom Speaker w/ Amazon Alexa lets you rock out to your favorite songs, and ask questions to Alexa! Just tap the speaker to ask Alexa a question, such as "How is my commute looking this morning?" and "What's the weather?" This durable Waterproof Outdoor Bluetooth Custom Speaker is perfect to take camping! It has a 6 watt output which produces a high quality sound. Guitar shape LED Light Promotional Key Tag is a fun way to keep an extra light handy. Keep your cords or earbuds from tangling by wrapping them around a customized cord wrap that's the perfect size for mailing campaigns. Hang this high quality Mobile Odyssey Waterproof Bluetooth Custom Speaker almost anywhere! It features a suction cup and a hook, and its small size means you can listen to music and take calls on-the-go. Listen to your favorite tunes while wearing these uniquely shaped custom earbuds that come with a microfiber drawstring pouch with your logo. This Full Color Dancing Bluetooth Custom Speaker rocks out to the beat of your music! It's hands are capable of holding a note or a business card. This dancing partner is best for any music stores, themed events or corporate party! Take this Full Color Outdoor Bluetooth Custom Speaker with you no matter where you go! It's tough enough to go on any adventure! This Wooden Bluetooth Custom Speaker features two premium 3-watt speakers which provide high quality sound. It can be used wirelessly via Bluetooth or with an auxiliary cable. Jam to your favorite songs with these unique Bluetooth Speaker Sunglasses w/ Custom Case! The two speakers are located in the sunglass arms, close to your ears. It also has a built in speaker, so you can take calls hands-free! Take your speaker with you wherever you go with this High Sierra NFC Bluetooth Outdoor Custom Speaker! This speaker has a wrist strap for easy portability. Listen to music and charge your phone at the same time with this 2-in-1 Bluetooth Custom Speaker Power Bank w/ Carabiner! This durable speaker is dustproof, drop proof, and waterproof. Keep your earbuds tangle-free with our Silicone Custom Earbud Wrap! Prevent tangles in your earbuds with these Retractable Custom Imprinted Earbuds. Receiving music promotional items from ePromos will be like music to your clients' ears. Get your message out with promotional cd covers, iPod products, and promotional mp3 players. All of our products can be imprinted with your company name or logo, so recipients are sure to see your name constantly. These items make great gifts and giveaways for both clients and employees. Bring some music into peoples' lives with our music promotional items today!